The answer to this question is really up to you. Do your research and understand the properties, cost and practices behind the mining of the gemstone your looking to purchase. Moissanite and white sapphires share some similar characteristics, while others stand in contrast with one another. If you want a stone that is naturally mined but has a lower price point, white sapphires would be a good choice. If you are looking for a socially responsible gemstone that will last forever at a revolutionary value, moissanite is your best bet. 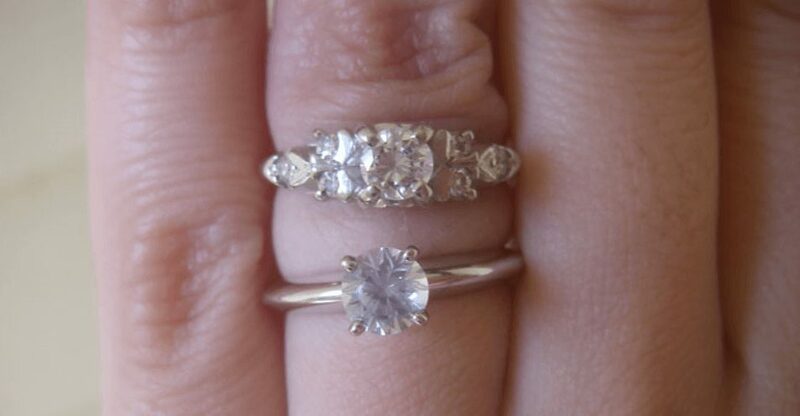 WHICH IS BETTER FOR ME – MOISSANITE OR WHITE SAPPHIRES? Forever One moissanite is a colorless gemstone that shines brighter than a diamond. Unlike white sapphires, moissanite is naturally found on earth but in such small quantities, that it’s not possible to cut gemstones from them. Moissanite is actually more rare than white sapphires and diamonds. Because of this, scientists conducted centuries of research to figure out how to grow moissanite (silicon carbide) in a lab. Today, we are able to offer the best quality lab-grown moissanite on the market today, Forever One. Moissanite has an unravel eye-catching sparkle. According to brilliance refractive index and fire dispersion scales, moissanite outshines white sapphires and diamonds. As you can see in the chart above, Forever One moissanite’s fire (the way a gemstone splits light into its individual wavelengths – giving the stone a “rainbow” like effect when exposed to light) is over 5x greater than that of a white sapphire. Moissanite ranks slightly higher on the hardness MOHs scale than white sapphire and both stone’s toughness is “excellent,” meaning both can withstand the rigors of daily wear. Forever One moissanite is not only the best diamond alternative, it’s a gemstone in its own right. Moissanite is lab-grown, which means no mining occurs in the creation process and it’s not involved in any conflict trade. We believe a gems beginnings are an important part of its unique story. At Charles & Colvard, we are on a mission to set new standards in the jewelry industry for eco-friendly and sustainable gems.